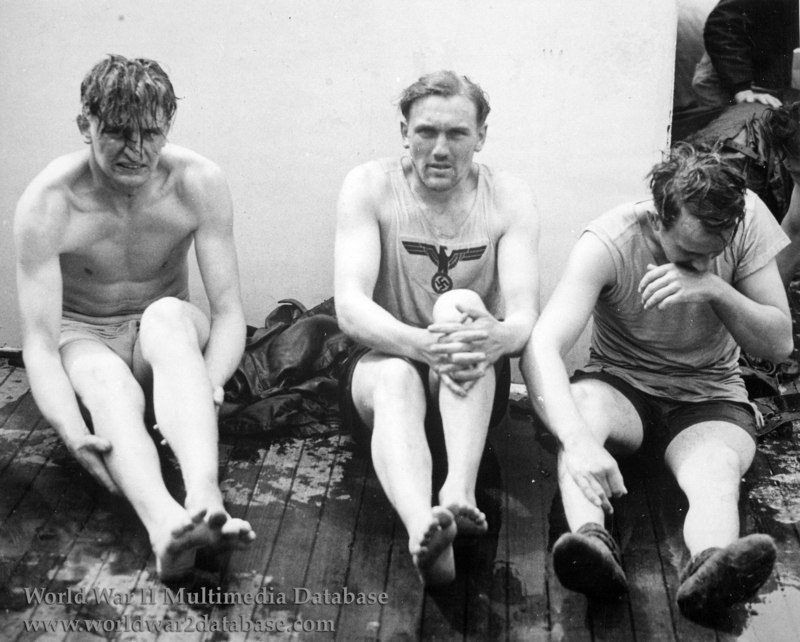 Fahnrich Ingenieur (Ensign Engineer) Karl Volker, from St. Leon-Rot, and two identified survivors shiver on the deck of USCGC Spencer (WPG-36) after being pulled from the North Atlantic when his U-Boat, U-175, was sunk attempting to attack Convoy HX-233 on April 17. 1943. His wet clothes behind him, the man in the center wears the Kriegsmarine eagle on his undershirt. After being depth charged and hit by heavy fire, forty-one German sailors were rescued by Spencer and USCGC Duane (WPG-33). Half-drowned, some wounded, the Germans were stripped, given hot coffee and cigarettes, and kept in the Wardroom of Spencer, where they ate corned beef, cabbage, and potatoes. American propaganda claimed they received better food then what was available on their submarine. They were taken to Scotland on April 20 and eventually sent to prisoner of war camps in the United States. Thirteen Germans and one American were killed in the battle. Spencer's Radioman Third Class Julius Petrella, of Brooklyn, New York, was buried at sea.